WHAT HAPPENED TO THESE PAYCHECKS? An employee has contacted your agency to notify you that she has not received a paycheck for the pay period 8/06/2004 to 8/19/2004, check dated 9/3/2004. The employee was recently placed on a leave of absence in her permanent position and placed in a Temporary Service in a Higher Class position effective the same day. However, a payroll check was not issued by Core-CT.
Where would you check to verify why a payroll check was not issued? Ms. I.M. Ottahere did not receive a pay check for the pay period ended 8/5/04, check date 8/19/04. What happened to this employee’s paycheck? What is the required corrective action? Note: Having an employee on a Leave of Absence on Job Data and active on Time Reporter Data will cause exceptions for anytime posted on or after the effective date of the leave. It should not cause a problem with time reported before the effective date. 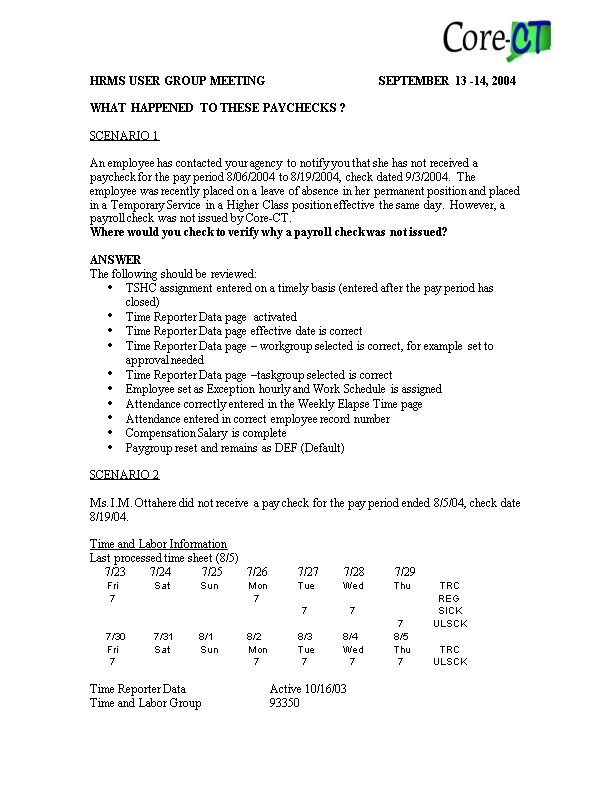 In this example, the employee should receive a paycheck for 7/23 to 7/28 provided there were no other processing issues. It was assumed, for illustrative purposes only, that the employee did not receive any paycheck and the information below addresses the corrective action required to pay the employee if this should occur. Employee on Leave of Absence on Job but active in Time Reporter Data. Time posted while employee on Leave of Absence creating exceptions for 7/29 to 8/5. Workgroup must match Employee Type on Job Data. Employee is in an Exception Time reporter Workgroup but has an Employee Type of hourly. Change Employee Type to Exception Hourly on Job Data. Enroll employee in zero hours schedule effective 7/29. Delete attendance for 7/29 to 8/5. Log ticket with Core-CT Help Desk to have row added on Time Reporter effective 7/29 to inactivate employee. Pay will automatically be processed for the next pay check. This will only be true if employee did not receive paycheck for 7/23 to 7/28 and there were no other processing issues. Have Central Payroll issue Petty Cash check for 14 hrs REG and 14 hrs SICK – only required if employee did not receive paycheck for 7/23 to 7/28. Enter attendance for 7/23 to 7/28 on Adjust Paid Time – only required if: employee did not receive a paycheck and an exception occurred for 7/23 to 7/28 and it is too late in the payroll processing period to clean up the exception. On Monday of pay confirm week, you discover that one of your employees is not showing up on the payroll register and, as a result, will not receive a paycheck. Before contacting the Help Desk, you perform some preliminary investigatory steps to determine why this employee did not appear in the payroll register. You have noted that everything appears routine with this employee with the exception that you have made some prior period adjustments for this cycle. You discover that this employee has somerejected time in Time & Labor. How would you know that there is rejected time out there? Look at payable time details” in the current pay cycle. It will state “rejected by payroll”. If the prior period adjustments affect pay, calculate the difference between original payment and correction and enter it on the additional pay page. Note, please remember to enter the effective date (the pay period begin date), the end date (the last day of the pay period), the correct earnings code (RTR), and the sequence number. SPECIAL NOTE: DO NOT make more than 4 pay periods worth of prior period adjustments in any given pay cycle. If there is a need to adjust more than 4 pay periods, use the additional pay page and record the change on Adjust Paid Time Page. WHY DO THE FOLLOWING PAY CHECKS HAVE ERRORS? In reviewing the payroll transactions in the payroll register on Tuesday morning of pay confirm week, it is discovered that an employee is receiving a payment to which he is not entitled. You review the transactions entered in the last pay cycle and note that a payment was made in the amount of $500.00 identified as RTR (retroactive payment). This payment was originally paid on the Additional Pay Page. Review Additional Pay Page—was an end date entered? Add a row on the effective dated line and enter effective date as the pay period begin date (of the current cycle being worked on) and enter the end date as the same day (pay period begin date). Thiswill prevent the payment from repeating in the current pay cycle. Mr. P.T. Maxlimit reports that his paycheck dated 8/20/04 is short 8 hours and his accrual balances are not correct. What errors occurred with this paycheck? Bonus: Employee works 64 hours or 80% - incorrect PL plan (enrolled in 60% plan). Employee lost 2.75 hours because he was at max. Employee in plans based on hours worked and took 19 hours of leave which reduced his accrual. Exception created for 7/27 because employee did not have enough PL time. This caused the entire day to be unpaid. Employee should be enrolled in leave plan that gives 80% PL time. Agency needs to recalculate the sick and vacation accrual to include the REG equivalent hours. An adjustment should then be entered on the Weekly Elapsed Time page using the appropriate adjustment TRC. To clear the exception the Weekly Elapsed Time page must be changed from 2 PL to 1.25 PL and .75 to something else OR request Central Payroll add 1.25 PL and .75 of something else to paycheck, make a record only adjustment on Adjust Paid Time page and delete the time from the Weekly Elapsed Time page for 7/27. If the employee should have 2 hours PL left, an adjustment must be made on the Weekly Elapsed Time page using the TRC PLAA. After the next accrual process is run, the .75 can be changed back to PL. WHO’S OUT ON WORKERS COMPENSATION? An employee initially filed a workers compensation claim as medical only. The employee is now losing work time. On the day after Payroll Confirm, your agency Workers Compensation Specialist notices that the information on the Claim Rate page has not populated. Where would you check to determine why the Claim Rate page has not populated? If either of these situations occurred, then various fields on Claim Rate will not calculate/populate. CTHRR 452 – Workers Compensation Day Calculation Error Report (which is produced the Monday after payroll confirms). There is a Job Aid for this report to help explain the error messages. CTHRB 453 – Worker’s Comp Rate Update report (which is distributed or “burst” daily). Under Claims Management – Claims Rate tab – agency manually entered information into one or more of the following fields: ”Disability Start Date”, “First Check Date” or “Return Date”. This prevents the fields of “First Check Days TPA is responsible for” and/or the “Last Period Days TPA is responsible for” from being populated by the system. Under Claims Management-Claim Rate tab-if the Effective Date on this screen is more than three (3) months prior to the current calendar date, the PS calculated rates will not process. Under Claims Management-Claim Rate tab-if the 52 Week Average Salary field is not populated, the PS calculated rates will not process. WHAT HAPPENED TO THE EMPLOYEE’S BENEFITS? Your agency hired an employee on 8/6/2004. Your Benefits Specialist can not process the Hire Event or once processed, the system does not offer health insurance options. Where would you check to determine why the Hire Event would not process or why the system did not offer health insurance options? What are the effects on Health and Life Insurance when using each of the following Action Reasons? Identify the impact on benefits and benefits billing.